Writing a report comes in different presentations with varying writing guidelines attached to each of it. One of these reports is the recommendation report. Technically, a recommendation report is created by a professional who has reviewed a number of items related to the creation of business decisions. Certain comparisons are made to identify the strengths and weaknesses of each item so that appropriate recommendations can be done. A lot of businesses from different industries rely on recommendation reports when it comes to identifying the best option either for acquisition, activity implementation or process development. Since there are different kinds of recommendation reports, there are also various characteristics that should be present in each document. However, there are also similarities that can be identified in each recommendation reports since the development of these documents is most likely the same. You may also see formal report examples. 1. The decision-making process within business sectors and establishments is very tedious. If there are no recommendation reports, then deciding the next move to implement may take a longer period of time which may also result in a waste of money and other resources. You may also see examples of a short report. 2. It requires professional help to ensure that the decision made by the management can benefit all the stakeholders of the company. The presence of recommendation reports especially coming from those who are experienced professionals can make it easier for the business to allocate certain resources to achieve their objectives and smart goals. 3. Recommendation reports ensure that the best products or activities are selected over their counterparts with lesser promise. As mentioned above; deciding what to buy; what to present, and what to implement can be onerous procedures. If the business already has a recommendation report, then they can easily know the pros and cons of the item that they will select. You may also see research report examples. 4. Having recommendation reports at hand can help establishments to maximize the potential of their budget, time and efforts. If proper decisions are made, then it can be advantageous for the current standing of the company as well as to its operations. You may also see performance report examples. 1. Ensure that you are aware of the problem that is currently existing. May it be an issue, an activity or any undertaking that is needed to be decided upon, you should provide a clear and thorough introduction to what it is all about. You may also see project report examples. 2. Create a document section which provides details regarding the purpose of the document. This can open the discussion relevant to the selection process which can serve as the foundation of information that the stakeholders will look at. You may also see employee report examples. 3. Specifically, mention all the items that you will compare. Doing this can help the stakeholders or decision makers have an image of the things that they will compare from one another. Sometimes, especially when partner brands are involved, the discussion can be more general. You may also see quality report examples. 4. Wrap-up your introduction by ensuring that you will be objective with the review that you will create and that your recommendation is based on facts and actual data. You may also see trip reports. 1. For your report to be maximized, provide details that can support the purpose of the recommendation. 2. Create a background that specifically identifies the positive and negative impacts of certain decisions. This can be technical, creative, or situational depending on the instance where the recommendation report will be used. You may also see activity report examples. 3. Have a precise showcase of each choice so you can present them accordingly. Ensure that you will include all the details that can be used for comparison so that people can be aware of how you came up with your recommendation. You may also like sales report examples. 4. Once you have already presented all the options, it is necessary for you to develop a section which presents the criteria or metrics that you will use for evaluation. Comparisons need a certain measure for it to be considered valid and credible. You may also see report examples in excel. 5. If you are already done presenting the metrics that you will use, the next thing to do is to identify the weight of each metrics or the measure on how certain criteria can affect your decision to recommend. You may also see sales report samples. 6. Start analyzing each item based on your presentation. It will be best if you can use categories to present each comparison so the entire discussion can be organized. More so, it can help the decision makers to align your recommendation with the results of each categorical comparison. You may also see progress reports. 7. Come up with conclusions and recommendations which states the best option in your opinion. Be specific when doing this as you do not want to mislead your readers. You may also see status report examples. Are You Ready to Make Your Recommendation Report? There are downloadable samples and templates of recommendation reports that you can use as guides and references whenever you are already ready to develop your own recommendation report. Ensure that you will refer to documents that are related and relevant to the object that you would like to achieve. You may also see monthly report examples. Just like in the creation of an evaluation report, the success of your recommendation report depends on the organization, usability, and relevance of the content that you will put in it. Hence, it is important for you to provide measurable, attainable, and realistic recommendations. 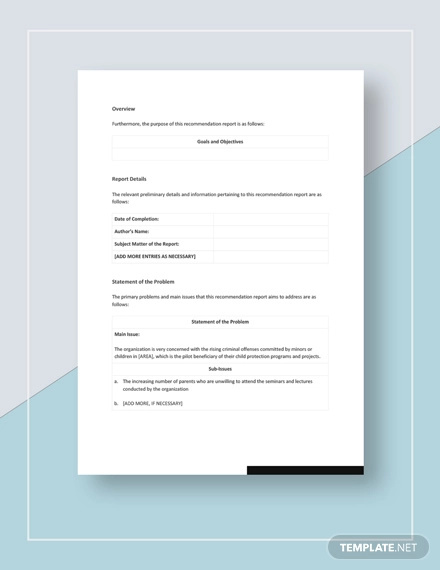 With the help of the information that you have provided, start drafting and creating a recommendation report that can be a valuable business document for your company.